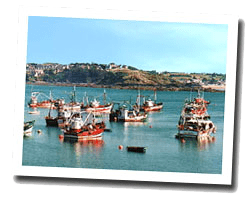 Major fishing port for the shell saint Jacques, Erquy is also a nice seaside resort in a protected environment. The Erquy headland offers wild moorland and breathtaking views over Saint-Brieuc bay. At the seaside you can find several wild sandy beaches. The more popular is in the centre of the village, near the port. 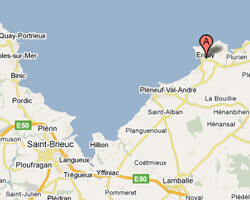 In Erquy enjoy a seaview holiday rental. apartment Located on the 1st floor of the residence Le Rial (with lift). view of the Sea and Port, 50m from the beach, town centre and shops 150m. 2 Bedroom(s), 2 double bed(s). Final cleaning : 40 €. Price from 300 € to 600 €. 7 rooms house 160sq. m 100 m from the sandy beach, Close to Erquy Cape. Garden 100sq. m with outdoor furniture, deck chairs and barbecue. fireplace. 5 Bedroom(s), 4 double bed(s). short stays possibility. Final cleaning : 60 €. 4 rooms house 80sq. m close to town centre and sea. balcony. Enclosed garden 400sq. m with outdoor furniture and barbecue. 4 Bedroom(s), 2 double bed(s). 2 rooms apartment 42m2. Close to the beach. balcony. Villa 5 rooms 120m2. terrace with barbecue. Pets allowed.